Google took advantage of the launch of social networking service Google+ to give Gmail a makeover. The company says the process of updating Google Apps is ongoing, and improvements have continued to roll out in recent weeks. Here's a primer to help you wade through the changes. --Multiple calls from Gmail. Google added the ability to place Gmail calls on hold and handle multiple calls simultaneously last week. The feature works for both incoming and outgoing calls, so it's possible to hold one call while placing or receiving another. --Choose an inbox style. Most Gmail users have likely already noticed an option at the top of their inbox to choose between the handful of ways Gmail sorts incoming mail. The options will be familiar to most -- starred first, unread first and Priority Inbox, which Google started offering last year. After users choose one of the options, the bar across the top disappears. To try a different inbox style, there's a drop-down on the Inbox link on the left-hand side. --View ZIP and RAR contents without downloading . Last week, Google added previewing capability for both types of attachments. It's now possible to see the contents of an archive within your inbox before downloading it. 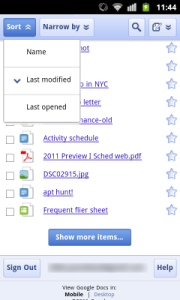 You can also download individual files from the archive to a local source or save them to Google Docs. --More sender information. A bit of a no-brainer here, but Gmail also now automatically displays the full address of mail from a person not in your contacts list. It also tells you when a message has come from a mail-sending service. The idea is to cramp down on phishing attempts. In fact, Gmail will now call your attention to messages it thinks might be after your personal information, giving you the option to report the address back to Google. --Spreadsheet keyboard shortcuts . A new keyboard shortcut sheet is available from within a Google Doc spreadsheet. Pressing Ctrl+/ or Cmd+/ brings it up. Another change: There's also now the ability to share Google Docs with the Android app and a few other upgrades to mobile capability. Google promises more improvements, following the announcement that it will be shutting down its Google Labs division to focus on existing products.